On Monday, August 13, 2018, at approximately 6:00 p.m., Cerritos Station Deputies responded to an indecent exposure call at the 11900 block of South Street, in the city of Cerritos. A preliminary investigation revealed the suspect exposed himself and sexually battered a female adult victim, who was shopping at the grocery store. The victim immediately notified an employee at the store, who then notified Cerritos Sheriff’s Station. 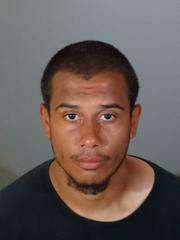 The suspect, Daniel Tejeda, a male adult, was arrested and transported to Cerritos Station where he was booked for indecent exposure and sexual battery. He is being held in lieu of $10,000.00 bail. Cerritos Station Detectives are seeking additional witnesses. Anyone having information regarding this crime is urged to contact the Cerritos Sheriff Station, attention Detective Sergeant Gilbert Ramirez, at (562) 860-0044. If you prefer to provide information anonymously, you may call "Crime Stoppers" by dialing (800) 222-TIPS (8477), use your smartphone by downloading the “P3 Tips” Mobile APP on Google play or the Apple App Store or by using the website http://lacrimestoppers.org.